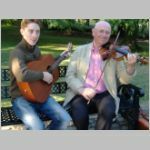 Tom is primarily known as The Newcastle Fiddle Player. A virtuoso musician and fantastic singer. The talented Dave Wood on guitar joins Tom this evening. This is another night to get to the club early.